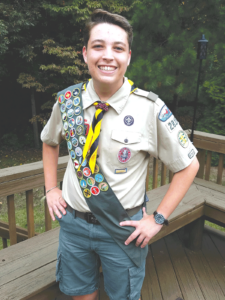 Jameson Connor Brooks, 15, son of Kimberly Brooks Spiers of South Chesterfield, achieved the rank of Eagle Scout on June 12. He is a member of Troop 2815 at Chester United Methodist Church. Brooks has been active in Boy Scouts since he was 8. He was awarded the Arrow of Light in March 2014 while he was with Troop 922 in Enon. For his Eagle Scout project, and in connection with his lifelong passion for trains, Brooks chose to benefit the Richmond Railroad Museum and led a team in building and installing a new exit bridge for the former Seaboard Coast Line Caboose No. 21019 there. His project greatly improved access and safety for all museum visitors. His cousins, Chris Sweat and Rob Sweat, were instrumental in helping Brooks complete his project. Through the generous donations that he received for his project, Brooks was also able to make a charitable contribution to the Richmond Railroad Museum in the amount of $450.